There was a sense, going in, that this was going to be an off year for the Tonys—at least when it came to the host. After all, the duty was assigned to Kevin Spacey, an actor most renowned for his intense dramatic performances rather than his song and dance chops. Put it simply: Frank Underwood did not seem the best man for the job to honor Broadway. And let’s get this out of the way: he wasn’t. Spacey was a last-minute choice, and he owned up to that during his opening number, which was entirely about the fact that he was low on the list of potential hosts. The self-deprecating medley cycled through parodies of songs from the Best Musical nominees—beginning with the eventual big winner Dear Evan Hansen—with the lyrics altered to be about Spacey’s own insecurities about hosting. The show was always going to feel muted compared to last year’s edition, which had the galvanizing presence of Hamilton as well as a tragic urgency given the proximity of the Orlando attack. But this telecast was weaker than usual. That’s largely Spacey’s fault. Though his introduction seemed to prove that at least he wasn’t going to sleepwalk through the job, it went downhill from there, as he fell back on dated impressions, failing to stretch any of his muscles. Hankering for that Johnny Carson bit? Spacey’s got you covered. What about Bill Clinton with a cringe-worthy joke about Hillary’s emails? Yup, that happened as well. Frank Underwood? You bet. As Lin-Manuel Miranda was handing out the final award, Spacey marched out as his House Of Cards character with co-stars Robin Wright and Michael Stamper silently in tow. And just when you thought you would get away without Spacey doing Bobby Darin, there he was closing with a nod to the artist he played in Beyond The Sea. Admittedly, that moment was saved by Patti LuPone joining him on vocals. But it wasn’t just Spacey who rendered the evening lackluster. That’s not, it should be stated, due to a bad season of theater. There were exciting works and performances represented across the categories. And yet producers failed to convey just how powerful they were. Take, for instance, the first performance from a nominated musical featuring the cast of Come From Away, a heart-wrenching production about the kindness of a Newfoundland town in the aftermath of 9/11. The camerawork was so bad it sucked all the emotion out of the moment. (And, frankly, was a bit nauseating). And then there was what we didn’t get to see. Bette Midler’s Hello Dolly! 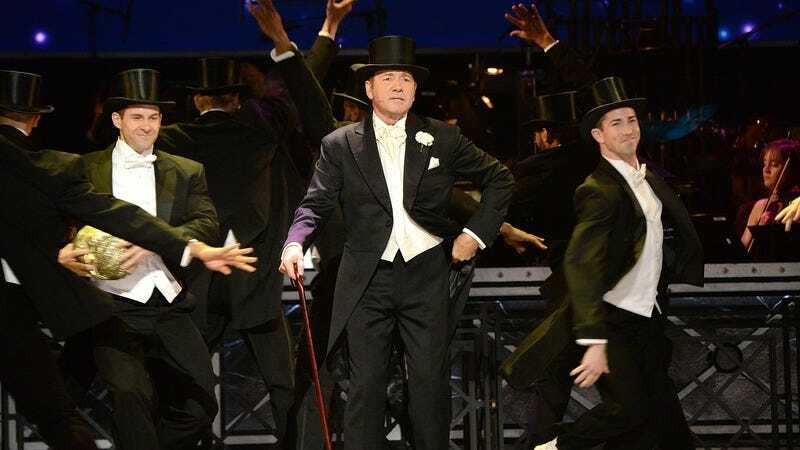 was arguably the marquee event of the Broadway season—a splashy turn from an entertainment legend in a classic musical. (Wall-E’s favorite, no less.) But, as expected, Midler didn’t appears as Dolly Levi due to some behind-the-scenes drama. Instead, David Hyde Pierce was the sole representative from the revival, doing a song, “Penny In My Pocket,” that you probably don’t know because it was originally cut. The Tonys are typically a testament to the work ethic of theater people who run from their matinees to the celebration and then get into costume once again. That Midler did not put on her Sunday clothes soured that sentiment. As this was all playing out, Delta and Bank Of America were pulling their sponsorships from the Public Theater—one of New York‘s great, groundbreaking institutions—due to Shakespeare In The Park’s Julius Caesar, which imagines the eponymous character as a Trumpian figure. Given how that was unfolding simultaneously, it was surprising how the ceremony was, for the most part, strikingly apolitical. Cynthia Nixon was one of the few to directly reference the current moment. In an acceptance speech for her featured role in the revival of Lillian Hellman’s The Little Foxes, she quoted the play in saluting those refusing to be idle while others “eat the earth.” Aside from that, few statements were made. Is it necessary for every award recipient in 2017 to take a stand? Of course not, but it was also just another way in which this year’s Tonys felt unfortunately irrelevant. Almost as irrelevant as a Johnny Carson impression. Despite my problems with the telecast, I was largely pleased with the winners, specifically Laurie Metcalf’s leading actress in a play trophy and Jitney’s win for Best Revival. Dear Evan Hansen’s Justin Paul and Benj Pasek—who won an Oscar for co-writing La La Land’s “City Of Stars”—now have two parts of the EGOT. John Legend is even closer to EGOT. I loved the touch of having playwrights describe their pieces. Even if you can’t get to New York to see them, these plays are well worth a read. Also: Watch Falsettos, in full, on PBS when it airs. A surprising highlight: The Rockettes performance. Not because of the Rockettes, but because of John Mulaney and Nick Kroll’s hilarious introduction and Cynthia Erivo and Leslie Odom Jr.’s always astounding vocals. This tweet from writer Dan D’Addario just about sums up my feelings about Midler’s speech, which should have been an exhilarating moment but left me somewhat cold. Spacey made not one but two jokes about coming out in the opening. The Daily Beast’s Kevin Fallon wrote an astute piece about what that means in the context of the long-standing rumors regarding the actor’s sexual orientation.